Summer can be terrible for your skin. Especially when you see all that healthy glow melting away with the sweat, and no beauty hack seems to work out. But ladies, do you know that you’ve got the ultimate weapon for all your beauty woes lying right in your freezer? 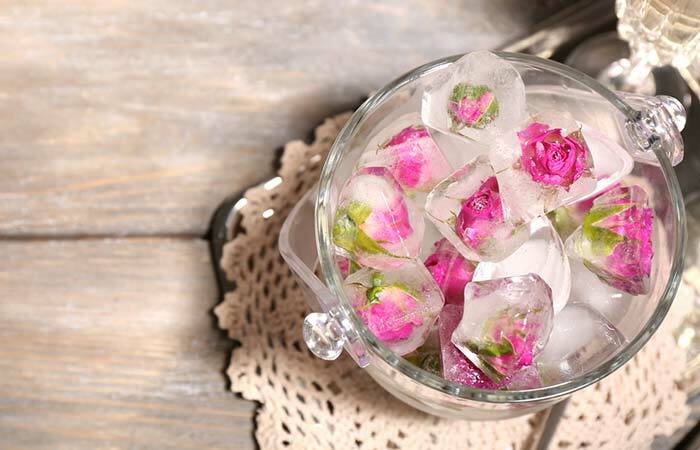 Whether you are trying to fight a pimple or make your makeup stick to your skin for longer on a hot summer day, an ice cube is the ultimate answer to all your worries! No matter what your skin condition, an ice cube on face can work like magic. Let’s check out how. Rubbing Ice Cube On Face: Is It Good? Rubbing ice on your face after a hectic day is exceptionally refreshing. If everyday stress is taking a toll on your face and skin, ice can help. It boosts blood circulation to your face and makes it radiant. 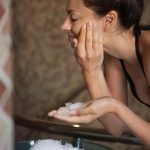 If you haven’t heard about the ‘Ice Facial’ yet, let me tell you that it is a prevalent Korean beauty trend. This has inspired beauty conscious people across the world to rub ice all over their face to keep it glowing and make it appear smoother. I know I’ve got you interested now! This cool trend is worth a try as it offers multiple benefits. How? Read on. 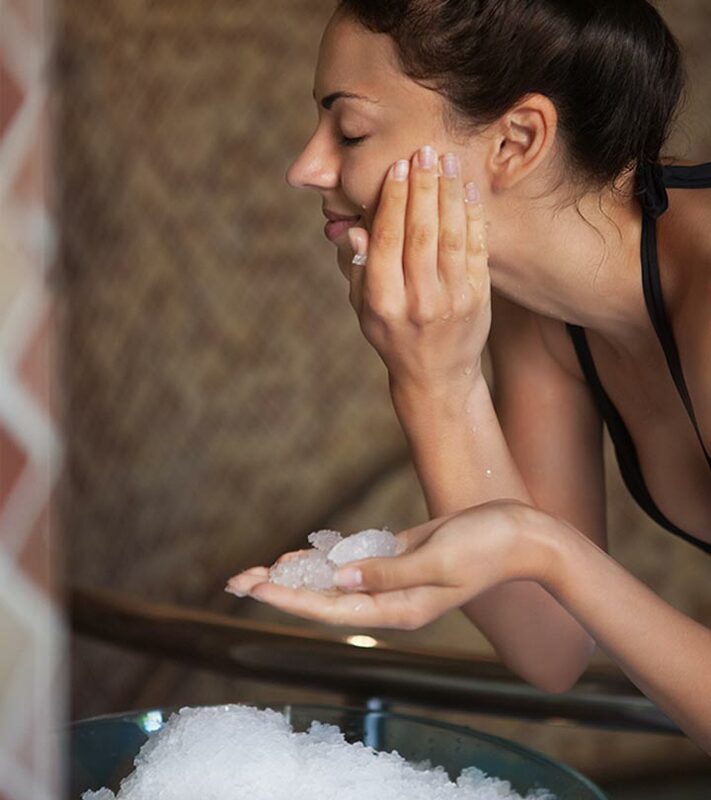 Everyone wants radiant and glowing skin, and an ice massage on the face can give you just that. It improves blood circulation to your skin and makes it bright. Applying ice to your face constricts the blood vessels, which initially lowers the blood flow to your skin. To balance that, your body starts circulating more blood to your face, which makes it lively and radiant. This is an age-old trick that ensures the skin absorbs all the products you apply to it. If you have applied night cream or any serum on your skin, rub an ice cube over it. This constricts the capillaries on your face and creates a pulling effect on your skin which, in turn, helps in better absorption of the products. 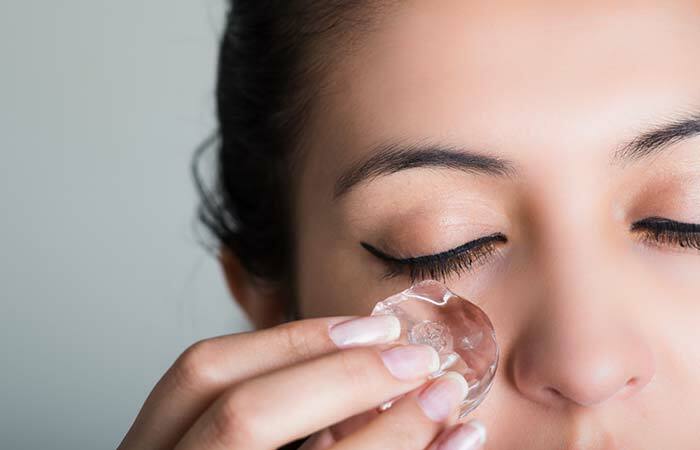 Applying ice to your face regularly can help you deal with stubborn dark circles. What you need to do is boil some rose water and mix cucumber juice in it. Freeze this mixture and then apply the ice cube to your eye area. But, don’t expect results overnight. As it works slowly, you will need to repeat this procedure for a few days to see results. If you are already frustrated with the pestering acne on your face, let ice cubes work their magic on it. When you use an ice cube on your face, it helps minimize oil production on your skin. It also works well in curing the bumps and swelling caused by acne. Tired looking eyes are such a big turn off! The excessive fluid accumulation under the eyes can be treated with an ice cube. Just move it in a circular motion from the inner corner of your eyes towards the eyebrows. This helps in reducing the swelling. Your face has pores that release natural oils and perspiration, thus aiding in keeping it clean. However, if dirt gets accumulated in the pores, it causes pimples and acne. Rubbing an ice cube on your face after washing it helps shrink the pores. This keeps out the dirt from the pores and your face clean. This is one beauty hack that never fails. Rub an ice cube all over your face before applying foundation. This makes your makeup look flawless and long-lasting. While you cannot reverse your age, you can control the signs of aging. 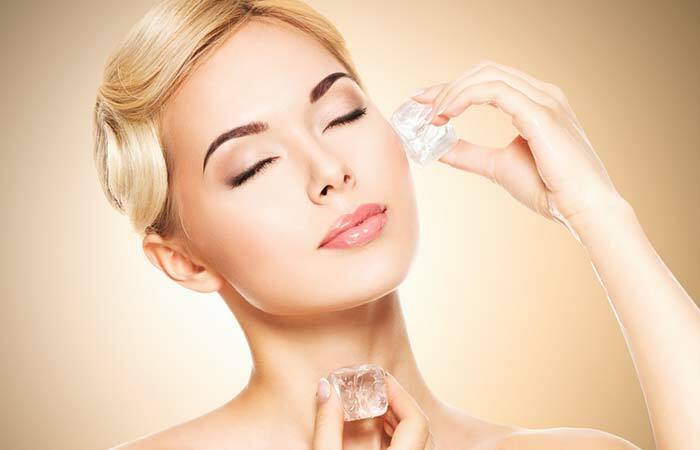 Applying ice cubes on your face helps in controlling wrinkles and signs of aging. 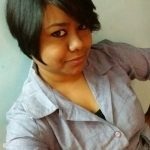 It not only helps in reducing the existing ones but also prevents the formation of new lines. Have chapped lips? Apply ice cubes on them! This helps in reducing the inflammation. Also, don’t forget to drink plenty of water to keep your skin and lips hydrated. Those who have suffered from heat rashes know the pain. Ice cubes are a natural remedy to cure such rashes. Wrap them up in a cotton cloth and rub over the affected area. This relieves the inflammation and heals the heat rashes. This is also a magic cure for your sunburns. After applying ice cubes on the sunburnt area, you can see a significant reduction in inflammation and redness. However, sunburns fade with time and with regular application. While having oily skin is a bane in itself, too much oiliness can be especially bothersome. Oily skin is often prone to outbreaks. 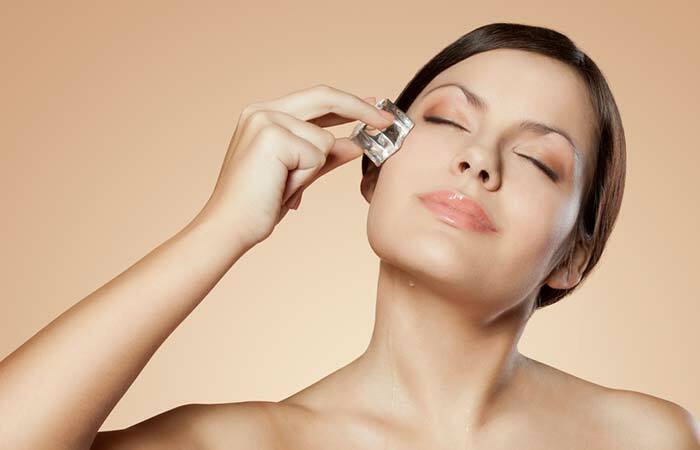 Applying ice cubes on your face can help in reducing excess oil production. This is because rubbing ice packs shrinks the oil-producing pores, thus reducing excessive oiliness. Tweezing your eyebrows is something you can’t go without. However, you cannot deny the pain caused by the process. You don’t need to suffer through that pain anymore. Rub an ice cube on the area to numb the pain and reduce inflammation. When it comes to exfoliation, you can ditch all the commercially available exfoliators for an all-natural and pure method. Rub your face with milk ice cubes. Milk contains lactic acid that helps in clearing all the dead skin cells while the ice cube improves your radiance and natural glow. Last minute rush? Don’t have enough time to apply your makeup? Spare just 2 minutes and rub an ice cube all over your face. Ice therapy on your face rejuvenates your skin, exfoliates it, and imparts a beautiful glow to it. Now, let’s amp up this ice game with a few more hacks. No doubt, applying plain ice cubes on your face will help, but mixing it with herbs and blends can be even more helpful. 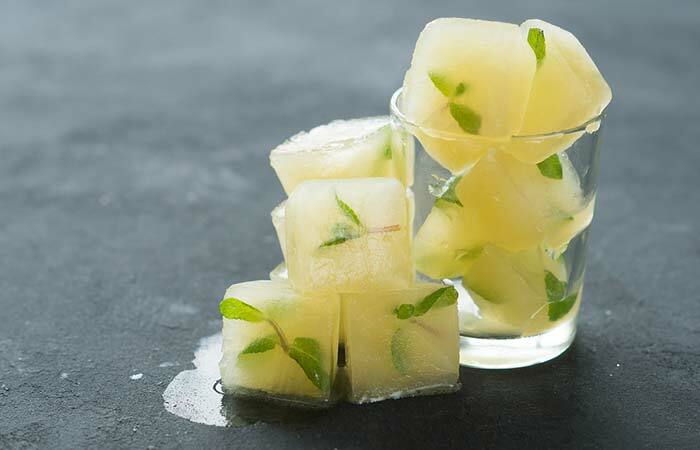 So, here are a few refreshing ice cube hacks for you. Put the green tea bags in hot water. Pour it into an ice cube tray and place it in the freezer. Apply a cube every day on your dark circles and puffy eyes. Let the water dry on its own. Avoid washing your face after this. Green tea contains antioxidants, and the ice helps reduce swelling and appearance of dark circles. Pour the aloe vera extract into the ice cube tray. You can also blend it a bit before you do so. Place the ice tray in a freezer. Apply on your face after sun exposure. Let it dry and do not wash off afterward. Aloe vera calms your skin and reduces inflammation. The ice has a soothing impact on your skin that’s scorched due to sun exposure. You will instantly feel relaxed. Blend the cucumber in a blender and mix the lemon juice into it. Pour it in the ice tray and let it freeze until the cubes are formed. Apply on your face after coming back home from a tiring day. Do not wash or dry your skin with a towel. Let it dry naturally. 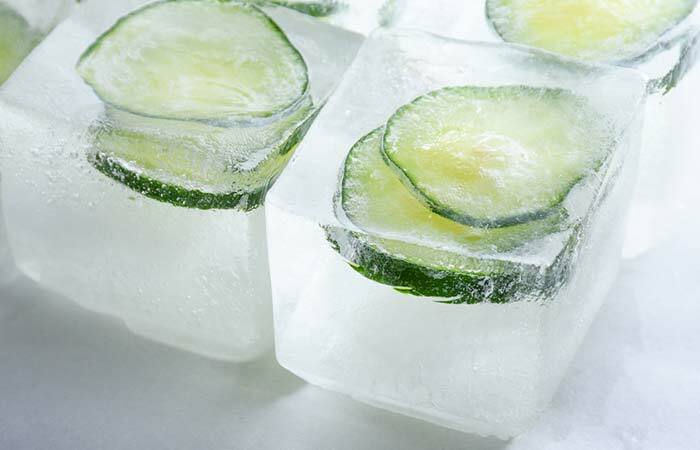 The combination of cucumber, lemon, and ice is incredibly soothing for tired skin. Cucumber has a soothing effect on your skin while lemon brightens it up. Mix the oils (or cinnamon powder) in water. Pour it in the ice tray and make ice cubes. Apply to the affected area or all over your face. Let the liquid dry. Do not wash. Follow this routine 3 times a week. Cinnamon has antibacterial properties while rosehip contains vitamin C. Ice shrinks your pores, thus reducing excessive oiliness. Mix all the ingredients in water and pour in the ice tray. Let the ice cubes set and then apply all over your face and neck. Let the liquid dry on its own. Don’t wash.
Rosehip oil has an antibacterial and anti-aging effect on your skin. Rose petals too have antibacterial properties and help in calming your skin. So, now you know the tricks to make ice cubes work for your skin. However, there are several things you need to keep in mind before you start using ice cubes on your face. Nothing done in excess is good. Avoid rubbing ice on your skin multiple times a day. Also, never apply ice cubes directly on your face. Always wrap them in a cotton cloth and then use. Before you start the ice treatment, ensure that your face is clean and without any makeup. Spend not more than a minute on a particular area while rubbing the ice cube on your face. Be careful while applying ice cubes around the eyes, especially if they contain any other ingredients. Ensure that they don’t enter the eyes. Always massage and rub in small circular motions. Remember, the ice therapy session should not last longer than 10-15 minutes. For best results, follow this therapy either in the morning or the evening. Ice therapy is exceptionally rejuvenating and easy on your pocket as well. However, you need to be consistent with your therapy. Otherwise, it will not have any impact on your skin. Have you ever tried ice therapy? If yes, what’s your favorite recipe? How did it help you? Share your experiences in the comments section below.